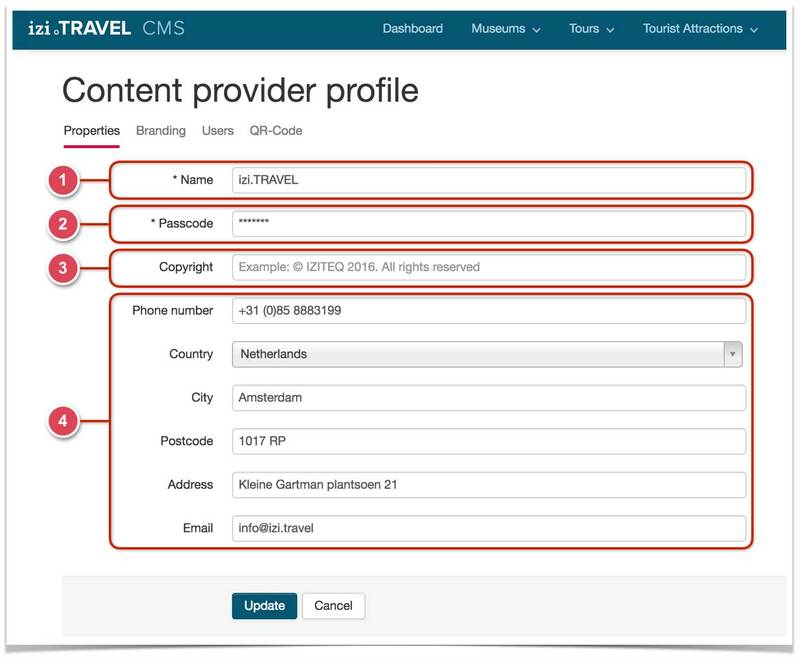 The content provider data entered at registration in the izi.TRAVEL CMS is stored in the Properties section. This data is used only for contact between the izi.TRAVEL.CMS administration and the Content Provider. In addition to data fields in this section, there are two other fields as well – “Passcode” 2 and “Copyright” 3. The “Passcode” contains an automatically generated combination of symbols. This combination is entered in the settings of the izi.TRAVEL mobile app to access the audio guides or their individual limited-access elements. You can place a copyright symbol in the “Copyright” field. It consists of the capital letter “C” in a circle, the name or designation of the copyright owner, and the year of first publication of the work. For example, © Local History Museum, 2015. The Copyright symbol is of informative nature and serves as evidence that a given person considers himself the owner of the exclusive rights to the product. The copyright symbol in itself cannot serve as the basis for establishing the fact of possession of any copyright to the work; however, it helps determine the legal ownership.